According to her we are not getting enough chlorophyll in our diets. By consuming green smoothies we can benefit from the blood cleansing, anti-inflammatory, and blood-sugar stabilizing effects of chlorophyll. You will find that you stop craving sweet snacks and junk food and instead will start to naturally desire more fresh fruits and vegetables. Caldwell offers readers advice about fasting on green smoothies, as well as general guidelines on incorporating green smoothies into a healthy balanced diet. Dieters are encouraged to emphasize raw fruit and vegetables and to supplement the diet with whole and unprocessed foods such as nuts, legumes, and sprouted grain bread. In addition to consuming green smoothies, Caldwell promotes the consumption of tea due to its high content of antioxidants and metabolism-boosting properties. You can choose from green, black, or oolong tea in accordance with your personal preference. The book places great emphasis on the importance of psychological factors such as emotional balance, positive attitude and visualization, in the creation of optimal wellbeing, with approximately half of the text being devoted to these subjects. Green smoothies, fruit, vegetables, legumes, sprouted grain tortillas, Manna bread, pecans, walnuts, almond butter, salmon, tea, stevia. Caldwell says that when you start drinking green smoothies you will have more energy and will experience increased motivation to exercise. She discusses the benefits of staying physically active through activities like brisk walking. The combination of green smoothies and exercise work together to alleviate depression and create a “wonderful new mood and attitude that can enhance all aspects of your life”. How Green Smoothies Saved my Life: A Guide for Using Green Smoothies, Uplifted Thinking and Live Food to Enhance Your Life retails at $14.95. Click here to purchase this book for discounted price. Promotes a very high intake of raw fruit and vegetables. Encourages the consumption of fresh and unprocessed foods. Provides instructions on how to make green smoothies with recipes. Acknowledges the importance of psychological factors for successful lifestyle changes. Recipe selection is very limited. Author is not a qualified health care professional. Many dieters will require more guidance to create a healthy eating plan. Some individuals are sensitive to the caffeine contained in tea. 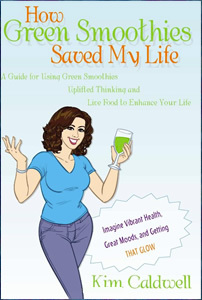 How Green Smoothies Saved My Life is a book outlining how the author experienced positive health benefits when she started consuming green smoothies on a regular basis. It includes a general introduction to green smoothies and guidelines on how to improve your health by increasing emotional awareness and supporting positive thought processes.